Kolby is a large 83lb male that had a very long racing career of 237 races. It is pretty rare for a greyhound to still be competitive after their 5th birthday and Kolby turned 5 on November 4th. He had a career that was much longer than most. He raced at Orange Park most of the time and raced at A and B level most of his career there, so was good. When he started to slow down a bit he was moved to Sanford Orlando Race Track in 2016 in hopes he would still be competitive there. He was retired after a little over a year there. His sire is Dutch Drummer and his dam is Dutch Sweet Kate. Kolby is a sweet, calm, loving guy. He passed his cat and small dog tests easily without interest in chasing either. He was more interested in getting attention from the people than the cat or the small fluffy dog. He is exceptionally loving and good with people and a very well behaved guy that wants to please. He absolutely loves having other greyhounds around and loved going to an all greyhound doggy day care. We think he would do best in a home with another greyhound. He needs a fenced yard because he doesn't potty well on leash and likes to find that special spot and have privacy to do his business. Kolby has been in a home since late January but he just never was happy there. His owner has a number of other dogs that steal his beds or try to curl up with him. Kolby is good with the other dogs but doesn't seem to be sure what to make of the other breeds and just gets up and moves off the bed politely. The other dogs seem to be drawn to him and won't leave him alone. If his adoptive mom corrects the other dogs for taking his bed or bothering him, sensitive Kolby thinks he did something wrong and leaves the room. 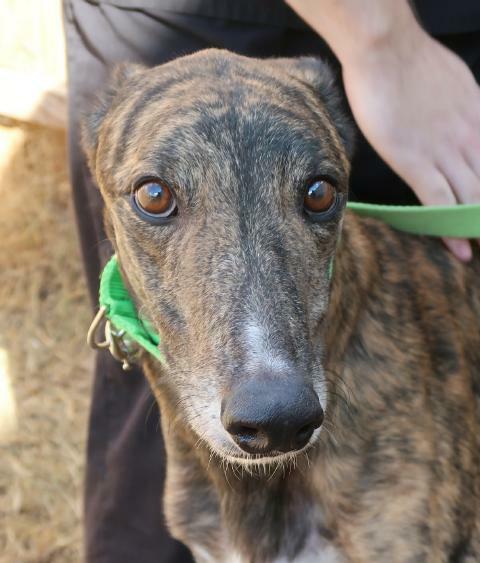 His adoptive mom has decided that although, Kolby is the perfect, loving, sweet, dog, he would be happier in a different home, one with greyhounds and fewer other breeds of dogs. At the track Kolby lived with a large pack of other greyhounds, but he had his own crate where he could eat and sleep undisturbed. He has been boarded with other greyhounds and he was happiest in a boarding situation around other greyhounds. He was reported to have a calming effect on the other dogs he was boarded with.